On Aug. 29 in Wilmington, Gov. 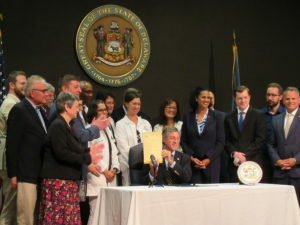 John Carney signed Senate Bill 227 to strengthen primary care services in Delaware through increased reimbursement rates, requiring all health insurers to participate in the Health Care Claims Database as a way to increase transparency in health care spending, and creating the Primary Care Collaborative to look for long-term solutions to the decreasing number of primary care providers in the state. In signing the bill, Gov. 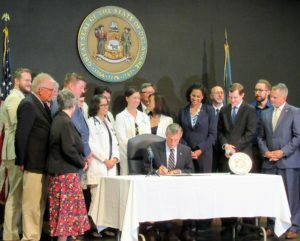 Carney said, “One of the challenges is to have a health care system that is sustainable.” He said the legislation will force more spending to occur on the front end of the health care system rather than the more expensive back end when people need extensive treatment, including hospitalization. 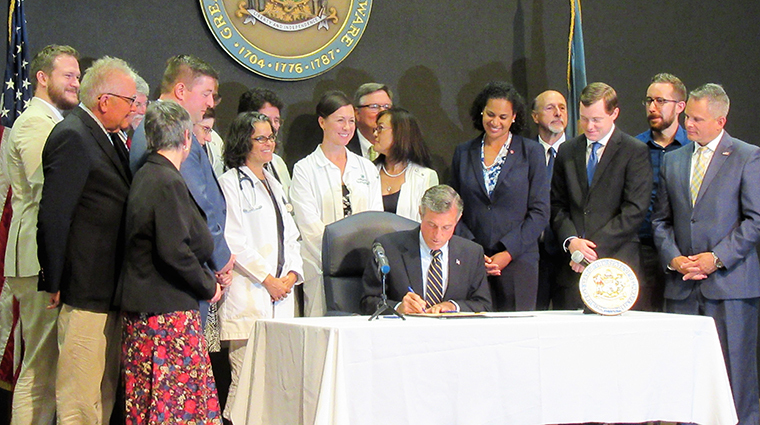 DHSS Secretary Dr. Kara Odom Walker, a board-certified family physician, said the legislation calls attention to the need for more data to understand how health care spending in divided in the Delaware. 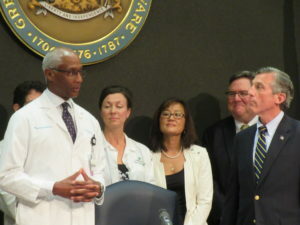 Dr. Richard Henderson, president of the Medical Society of Delaware, said the increased reimbursement rates over the next three years will give stakeholders time to find long-term solutions for strengthening primary care. 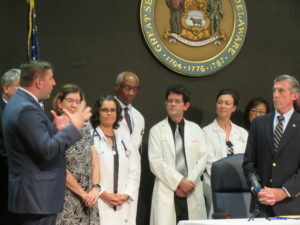 SB 227 was sponsored by the Medical Society of Delaware and many other health care stakeholders, including Health Care Commission Chair Dr. Nancy Fan. The first Primary Care Collaborative will be from 4-5:30 p.m. Sept. 5 at the Medical Society, 900 Prides Crossing, Newark.